Homeobox genes are the key regulators during development, and they are in general highly conserved with only a few reported cases of rapid evolution. RHOXF2 is an X-linked homeobox gene in primates. It is highly expressed in the testicle and may play an important role in spermatogenesis. As male reproductive system is often the target of natural and/or sexual selection during evolution, in this study, we aim to dissect the pattern of molecular evolution of RHOXF2 in primates and its potential functional consequence. We studied sequences and copy number variation of RHOXF2 in humans and 16 nonhuman primate species as well as the expression patterns in human, chimpanzee, white-browed gibbon and rhesus macaque. The gene copy number analysis showed that there had been parallel gene duplications/losses in multiple primate lineages. Our evidence suggests that 11 nonhuman primate species have one RHOXF2 copy, and two copies are present in humans and four Old World monkey species, and at least 6 copies in chimpanzees. Further analysis indicated that the gene duplications in primates had likely been mediated by endogenous retrovirus (ERV) sequences flanking the gene regions. In striking contrast to non-human primates, humans appear to have homogenized their two RHOXF2 copies by the ERV-mediated non-allelic recombination mechanism. Coding sequence and phylogenetic analysis suggested multi-lineage strong positive selection on RHOXF2 during primate evolution, especially during the origins of humans and chimpanzees. All the 8 coding region polymorphic sites in human populations are non-synonymous, implying on-going selection. Gene expression analysis demonstrated that besides the preferential expression in the reproductive system, RHOXF2 is also expressed in the brain. The quantitative data suggests expression pattern divergence among primate species. RHOXF2 is a fast-evolving homeobox gene in primates. The rapid evolution and copy number changes of RHOXF2 had been driven by Darwinian positive selection acting on the male reproductive system and possibly also on the central nervous system, which sheds light on understanding the role of homeobox genes in adaptive evolution. Homeobox genes encode homeobox proteins that play a crucial role in various developmental processes as transcription factors. A key feature of homeobox proteins is the homeodomain, a 60-amino-acid helix-turn-helix DNA-binding domain . Due to their functional importance during development, most of the homeobox genes (especially the homeodomain) are highly conserved at sequence level [1–3]. There have been only a few published examples of rapid evolution of homeobox genes, such as OdsH in flies , Hox genes in nematodes [5, 6], the Rhox5 cluster genes in rodents [7–12], and TGIFLX and ESX1 in primates [13, 14]. Here we report a novel case of rapid evolution as well as copy number variation (CNV) of an X-linked reproductive homeobox family gene, member 2 (RHOXF2) in primates. This homeobox gene is involved in spermatogenesis and may also play a role in brain function. RHOXF2, selectively expressed in the testis, was initially identified as a member of the PEPP subfamily . The human RHOXF2 gene is also named as testis homeobox gene 1 (THG1) or human paired-like homeobox protein (hPEPP2). It is located on Xq24 and contains 4 exons encoding a 288-amino-acids protein with two functional domains, the homeodomain and the proline-rich domain (figure 1a). In humans, there are two copies of the RHOXF2 gene on Xq24 in a head-to-head orientation, i.e. RHOXF2 and RHOXF2b . The Rhox (reproductive homeobox on the X chromosome) cluster genes in rodents have been considered to be orthologs of human RHOXF2 . Recent studies have shown that the human RHOXF2 protein is functionally similar to the rodent Rhox5, the founding member of the Rhox cluster, expressed in the Sertoli cells of the testis and promoting survival and differentiation of the adjacent male germ cells during spermatogenesis [8, 16–18]. Similar to the Rhox cluster genes in rodents, the human RHOXF2 can down-regulate the expression of Unc5c and Pltp, and up-regulate Gdap1 expression in the Sertoli-cell pathway promoting germ cell survival [16, 18]. Interestingly, all three down-stream genes directly regulated by RHOXF2 in the testis also play important roles in the nervous system. In the brain, Unc5c is a receptor of netrin-1, which is important for axonal guidance, neuron migration and proliferation [19, 20]. Pltp is an important modulator of the signal transduction pathways in the human neurons, and is likely involved in neurodegenerative and inflammatory brain diseases [21, 22]. Gdap1 is involved in a signal transduction pathway in neuronal development, and is responsible for various Charcot-Marie-Tooth diseases, the most common peripheral neuropathy [23, 24]. The schematic genomic structure of RHOXF2 gene copies in humans (a) and chimpanzees (b). (a) There are two 48.9-Kb segmental tandem repeats containing two copies of the RHOXF2 gene, i.e. RHOXF2 and RHOXF2b in the human genome. (b) Three segmental tandem repeats containing three copies of RHOXF2 gene are constructed for chimpanzees according to the three known BAC (bacterial artificial chromosome) clones (281C1, 349N3 and 565A12) of a male chimpanzee (CHORI251). The black triangles indicate endogenous retrovirus (ERV) sequences flanking the breakpoints. Due to the function of RHOXF2 in spermatogenesis and possibly in the central nervous system, we studied the evolutionary pattern of this homeobox gene in primates, and we observed frequent gene duplications/losses and rapid protein sequence changes. We also performed expression pattern analysis in multiple primate species, and examined between-species and between-paralogs expression divergences. Our evidence suggests that the rapid evolution of RHOXF2 at both the sequence and expression levels is likely to have been caused by selection on the male reproductive system and possibly also on the central nervous system. In humans, there are two RHOXF2 gene copies on Xq24 in a head-to-head orientation, RHOXF2 and RHOXF2b (figure 1a) . We sequenced the entire coding sequences (867bp) and about 600bp adjacent noncoding regions (including the entire 185bp intron-1 and the flanking sequences of the exons) in 111 human individuals (including African, European, Melanesian and East Asian; 83 males and 28 females). There are 14 individuals (12 males and 2 females) showing no heterozygous sites in the entire sequenced region. This suggests that these individuals either have two identical or only a single copy of the RHOXF2 gene located on the X chromosome. In the reference human genome, there are two 48.9-Kb segmental tandem repeats containing the two RHOXF2 copies (figure 1a). We sequenced the genomic regions covering the breakpoints of the two segmental repeats in 30 human genomic DNA samples (including all individuals without heterozygous site and all individuals subject to qPCR). The data indicated that the breakpoint sequences exist in all individuals (including 14 individuals without heterozygous sites), implying that they all have two copies. This result was further confirmed by genomic DNA real-time quantitative PCR of 9 individuals with heterozygous sites (4 males and 5 females) and 8 individuals without heterozygous sites (7 males and 1 female) (see additional file 1). Using TKTL1, an X-linked single copy gene as a control, we found these samples are no difference in RHOXF2 genomic DNA quantity (P > 0.05, T test). Collectively, our data demonstrate that the two copies of RHOXF2 are fixed in contemporary humans. To see whether the two-copy structure is conserved in nonhuman primates, we first conducted PCR-based sequencing of the entire coding region of the 16 non-human primate species (table 1). A single copy X-linked gene would have no heterozygous site in males, therefore heterozygous sites in males suggest more than one gene copy. Our results showed that three species (chimpanzees, pig-tailed macaques and rhesus macaques) have heterozygous sites in males, suggesting more than one copy in them. The two leaf monkey species (all females) also have heterozygous sites. Since a single copy X-linked gene would also have heterozygous sites in females due to within-copy polymorphisms, their copy numbers were then determined by genomic DNA qPCR. The other 11 nonhuman primate species do not exhibit any heterozygous sites, implying either a single copy or two/multiple identical copies, which was then tested by genomic DNA qPCR. According to the genome database, there are two copies in the white-tufted-ear marmoset (one intact copy and one incomplete copy due to low quality of the sequence assembly) (http://genome.wustl.edu). * The number of individuals for genomic DNA analysis, brain cDNA expression analysis, testis cDNA expression analysis and multi-tissue expression analysis, respectively. To identify the RHOXF2 gene sequences of individual copies, we cloned and sequenced the PCR products of the five species with heterozygous sites. In pig-tailed macaques and rhesus macaques (all males), we identified two distinct sequences in both species, implying the presence of two copies. In rhesus macaques, there are 6 fixed single nucleotide differences between the two copies and all of them are non-synonymous substitutions located in the proline-rich domain (see additional file 2). We then sequenced 20 rhesus macaque individuals (including both males and females). Interestingly, all 20 rhesus macaques possessed the same two copy sequences without any within-copy polymorphic sites, implying strong functional restriction. The fixed sequence divergence between the two rhesus macaque copies is totally different from the pattern seen in humans, and the two human copies do not exhibit any fixed substitutions. The grey leaf monkey and the black leaf monkey (all females) also possess two distinct sequences with 16 (14 non-synonymous and 2 synonymous substitutions) and 15 (13 non-synonymous and 2 synonymous substitutions) substitutions respectively. 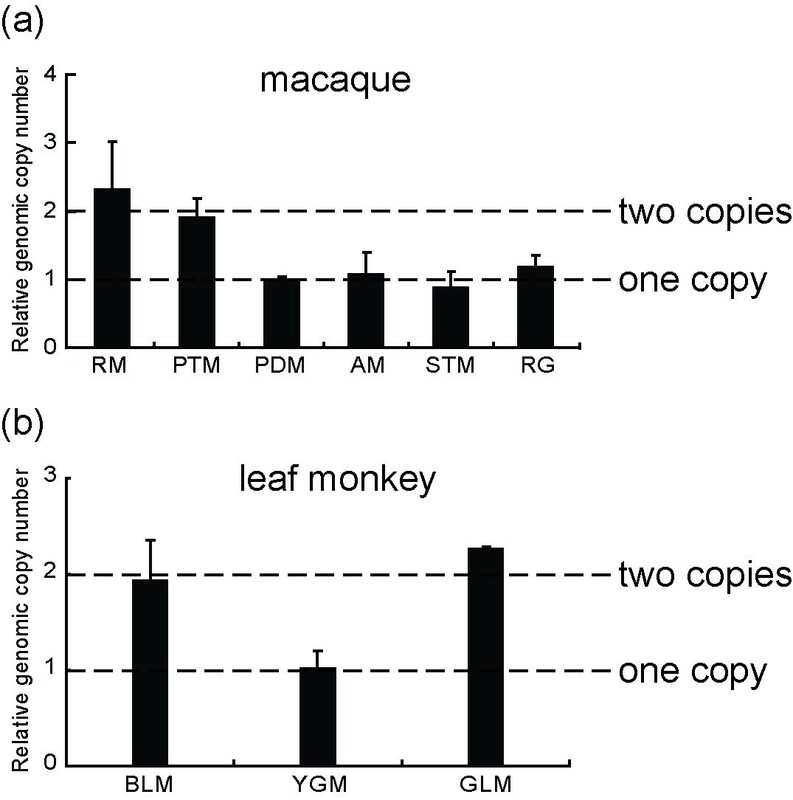 The majority (14/16 for grey leaf monkey, 14/15 for black leaf monkey) of the substitutions are shared between the two species, suggesting that the substitutions are between-copy divergences instead of within-copy polymorphisms. Therefore, grey leaf and black leaf monkeys likely possess two copies of RHOXF2 (see additional file 2). Phylogenetic analysis revealed that gene duplication occurred before the two species diverged (figure 2). The phylogenetic tree showing sequence substitution pattern of each primate lineage. The numbers of non-synonymous and synonymous substitutions (N/S) and the amino-acid insertions-deletions are labeled for each lineage. The labeled "8/0" between HUM-1and HUM-2 only represents the total N/S sites in the human population, and the labeled "7aa-del 2/1" between CHP-1 and CHP-2 just represents the sequence difference between the within-species copies. Using marmoset sequence as outgroup, all internal node sequences were inferred by PAML. The lineages showing Ka/Ks ratios significantly larger than one are denoted by '*' (p < 0.05) or '**' (p < 0.01). The solid bars indicate the duplication events, and the dashed bar on the chimpanzee lineage indicates the uncertainty of number of duplication events. The lineages leading to humans and chimpanzees since the most recent common ancestor of Catarrhines (node E) are shown in thick lines. For the abbreviations of the primate species, refer to table 1. 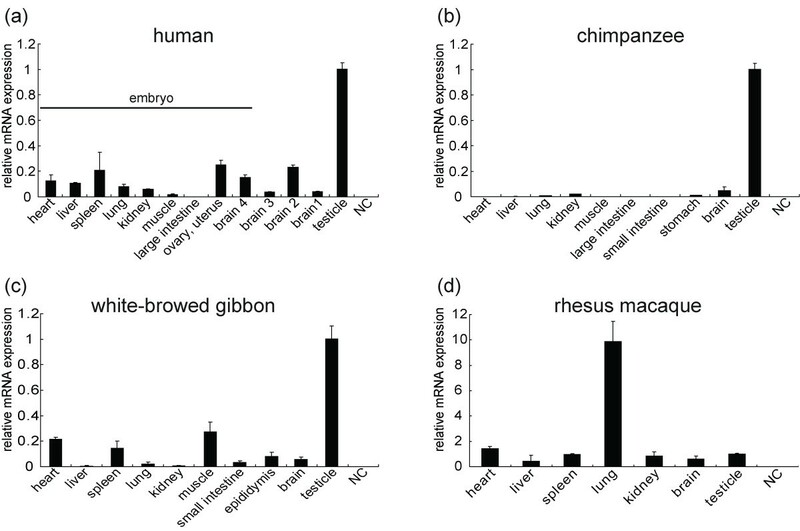 The results of genomic DNA qPCR indicated that the RHOXF2 genomic DNA quantities of rhesus macaques and pig-tailed macaques are about twice those of other macaque species with no heterozygous sites (figure 3a). The same result was also seen for leaf monkeys when compared with the Yunnan snub-nosed monkey (no heterozygous sites) (figure 3b). The data further supports that rhesus macaques, pig-tailed macaques, grey leaf and black leaf monkeys possess two RHOXF2 gene copies, and there is only one copy in the nonhuman primate species without heterozygous sites. The result of genomic DNA qPCR in macaques (a) and leaf monkeys (b). (a) RM and PTM showed about 2 fold of RHOXF2 gene genomic DNA compared to the other macaques. (b) BLM and GLM showed about 2 fold of RHOXF2 gene genomic DNA compared to YGM. The single copy X-linked gene, transketolase-like 1 (TKTL1) is the reference gene. For the abbreviations of the tested primate species, refer to table 1. In chimpanzees, we identified at least 4 different sequences by screening the 26 cDNA clones from the testicle of a male individual, suggesting multiple copies in its genome (see additional file 2 and additional file 3). To explore the detailed genomic structure of RHOXF2 gene copies in the chimpanzee, we screened the BAC (bacterial artificial chromosome) library of a male chimpanzee (CHORI251). We obtained 7 positive BAC clones containing the RHOXF2 gene sequence, including 281C1, 349N3, 565A12, 602H9, 792F3, 792G12 and 834E8. For three of them (281C1, 349N3 and 565A12), sequences are available in the NCBI database [GenBank: AC145687, AC142344 and AC183597]. Our BAC-end and breakpoint-region re-sequencing confirmed the sequence alignments of the contig (315 kb) containing the three NCBI BAC clones, and 3 copies of RHOXF2 gene are located within this contig (figure 1b). Two of the three copies are orthologs of the two human copies according to the synteny of this genomic region. We then partially sequenced the other 4 BAC clones, and we found that 792F3 showed sequence differences from the 3 known BAC clones, an indication of at least one extra copy in chimpanzees. Finally, we performed genomic DNA qPCR and the result showed that the copy number in chimpanzees is about 3 times (3.03 ± 0.65) larger than in humans, suggesting 5-7 copies in chimpanzees. Combining the data from the BAC clones and the cDNA clones from testicle and brain samples (see additional file 2 and additional file 3), there are at least 6 copies in the chimpanzee genome. To reveal the genomic locations of all these copies in chimpanzees, using BAC clone 281C1 as the probe containing a complete copy of RHOXF2, we performed chromosome fluorescence in situ hybridization (FISH). The results indicated that all signals are located in the long arm of X chromosome (see additional file 4), suggesting that all the copies are possibly tandem duplications on Xq24, which was partially reflected by the determined genomic structure of the three copies in chimpanzees (figure 1b). Additionally, we sequenced the entire RHOXF2 gene coding region of six chimpanzee individuals (genomic DNA samples). We observed in-del polymorphisms in exon 2 of three chimpanzees, implying that copy number variation might exist in chimpanzees. We also performed cDNA sequencing of testicle samples in chimpanzees, and there are frame-shifting in-del polymorphisms, suggesting that there are non-functional copies (pseudogenes) (see additional file 2). In humans, based on the sequences of male individuals, a total of 12 haplotypes were inferred using PHASE . Interestingly, we did not observe any fixed substitutions between the two human copies. The haplotype pattern indicates that almost all the substitutions are shared by the two copies, suggesting frequent non-allelic homologous recombination between them. 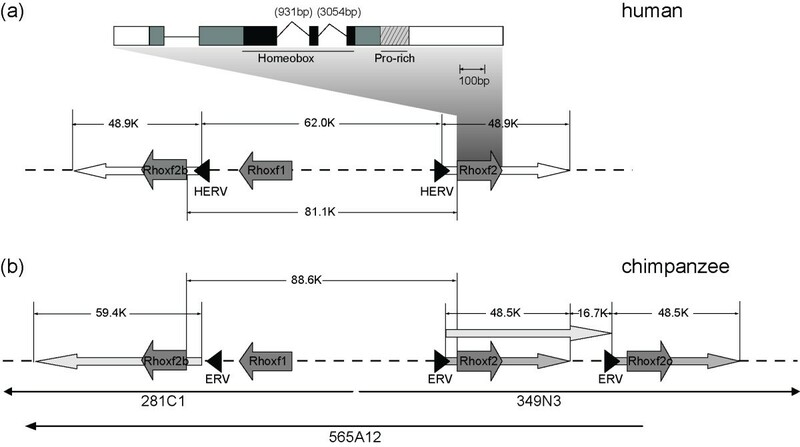 Further investigation showed that there are two human endogenous retrovirus (HERV) sequences located at the breakpoint region of the two copies (figure 1). They are ERV3-like sequences, similar to HERV15Yq1 and HERV15Yq2 located at Yq11 in the human genome . It has been shown that the intra-chromosomal homologous recombination between HERV15Yq1 and HERV15Yq2 can mediate duplications and deletions of the azoospermia factor A (AZFa) region on the human Y chromosome, resulting in male infertility [27–29]. We used the HERV15 LTR 787-bp segment sequence as a reference to acquire the HERV sequences located at Xq24 from genome database . It turned out that there is almost no difference (1/783bp) between the two HERV sequences flanking RHOXF2 (see additional file 5). Thus, the flanking locations of the two HERV sequences and their high sequence similarity suggest that the HERVs may mediate frequent non-allelic recombinations of the two human copies, similar to the mechanism known for the AZFa region [27, 28, 30]. In the database of Genomic Variants and 1000-Genomes, low frequency copy number variations (CNVs) were observed in humans covering the RHOXF2 gene region (http://projects.tcag.ca and http://browser.1000genomes.org) [31, 32], supporting the proposed non-allelic recombinations mediated by the HERVs. Further analysis indicated that there are also ERV sequences near RHOXF2 in the four nonhuman primate species as their whole-genome sequences available for study (chimpanzee, gorilla, orangutan and rhesus macaque) (see additional file 5). Therefore, it is possible that endogenous retrovirus sequences are the key elements causing non-allelic recombinations, resulting in copy number variation among primates. In the marmoset, we found only one ERV sequence near RHOXF2, which is likely due to the insufficient coverage of this genomic region. Compared with the human sequences (1/783), the orthologous nonhuman primate ERV sequences are highly diverged (20/780 in chimpanzee, 90/776 in gorilla, 57/767 in orangutan and 109/775 in rhesus macaque) (see additional file 5). This implies that frequent non-allelic recombinations might not have occurred in nonhuman primates involving two RHOXF2 copies (rhesus macaque, pig-tailed macaque, grey leaf and black leaf monkey). For example, in the rhesus macaque, we identified only two RHOXF2 coding-region haplotypes with six fixed between-copy substitutions (see additional file 2). This is consistent with previous computational analysis as well as data for Arabidopsis, which proposed that the recombination frequency decreases very rapidly with the increase of sequence divergence [33, 34]. In chimpanzee, there are more than two ERV sequences (figure 1b), resulting in a more complicated pattern requiring further illumination through future detailed sequence analysis. Additionally, for the 11 primate species with no heterozygous site, the distinct sequence divergence between the flanking ERVs (in gorilla and orangutan) is consistent with our proposal of one RHOXF2 copy in these species, as determined by genomic DNA qPCR (figure 3). We conducted coding sequence comparison among the primate species as well as phylogenetic-tree-based analysis for the molecular signatures of selection. To simplify the phylogenetic analysis, we generated two sequences by randomizing the SNPs of humans and chimpanzees respectively to represent their RHOXF2 coding sequences. Different combinations of randomizing the SNPs gave rise to the same results, and it remains unaffected under the most conservative scenario in which the sequence was reconstructed in each species without any non-synonymous changes (see additional file 6). All of the sequences from the other primates have distinctive haplotype sequences confirmed by clone sequencing. The intact copy of the marmoset sequence was used as an out-group. The aligned protein sequences revealed high substitution rates (as well as frequent in-dels) for RHOXF2 in Catarrhini primates (see additional file 7) We found that 69.8% (206/295) of sites have become variable since the most recent ancestor of Catarrhine. In other words, only 30.2% of amino acids are identical among the 17 primate species, an indication of rapid evolution. Besides amino acid changes, there are also multiple deletions/insertions of short amino acid fragments, especially along the lineages to humans and chimpanzees (figure 2). Notably, the fixed protein sequence divergence between human and chimpanzee is 5.7% (16/281), which is much higher than the genome average (1.34%) . The comparison of non-synonymous (Ka) and synonymous (Ks) nucleotide distances between gene sequences can detect selection acting on a gene. 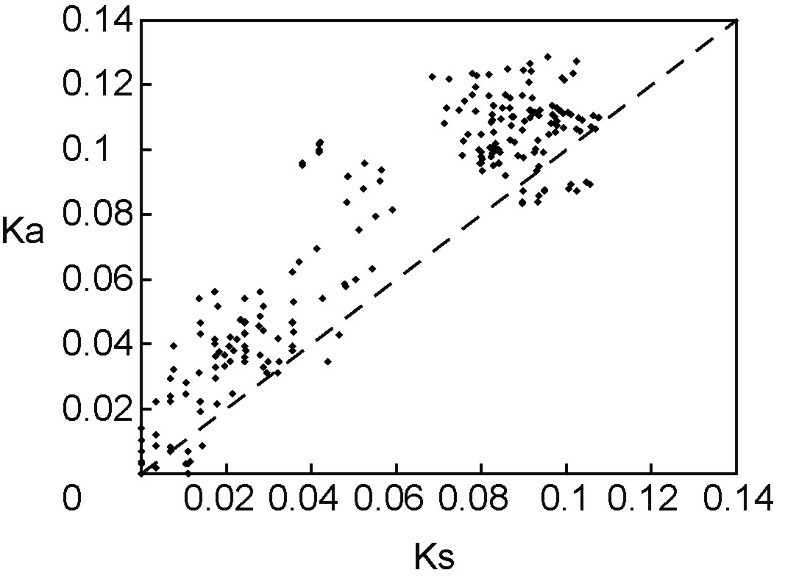 A high Ka/Ks ratio (>1) indicates positive selection, whereas a lower Ka/Ks ratio indicates negative selection (<1). The Ka versus Ks ratios for all species indicated high values (Ka/Ks > 1) in 222 out of the 253 pairs (87.7%) (figure 4, see additional file 8), an implication of deviation from the expectation of neutrality (Ka/Ks = 1) and strong positive selection on RHOXF2 during primate evolution. The signal of positive selection in primates was confirmed by comparing Model 2a (selection) and Model 1a (neutral) using the maximum-likelihood method (2ΔLnL = 31.88, P = 0.000000194) . We also examined the detailed substitution pattern of each primate lineage in the phylogenetic tree (figure 2). The Ka/Ks ratios of many primate lineages are larger than one, and some are statistically significant, especially the lineages leading to humans and chimpanzees, and the lineage to the Yunnan snub-nosed monkey (figure 2) [37, 38]. Plot of pairwise Ka/Ks ratios in the primate species. There are 222 out of the 253 pairwise Ka/Ks ratios (87.7%) showing large values (>1). Ka/Ks ratios were estimated following Pamilo-Bianchi-Li's method [65, 66]. Notably, all of the Ka/Ks ratios for the lineages leading to humans and chimpanzees since the most recent common ancestor of Catarrhines are larger than 1 (thick lines in figure 2). The likelihood ratio test (modified model A test) indicated that these lineages have a significantly larger ω (dN/dS) value (>1) (2ΔLnL = 4.23, P < 0.05), suggesting strong positive selection during the evolution of humans and chimpanzees (table 2). In comparison, another Rhox family member RHOXF1, located in the same genomic region (figure 1a), evolved much more slowly than RHOXF2 (table 2). In the 111 human individuals tested, we observed eight sequence polymorphisms (SNPs) and all of them are non-synonymous substitutions (83A/T, 93N/D, 151R/C, 151R/H, 176L/F, 209Q/H, 235G/D and 286 P/L). Surprisingly, three of them (151R/C, 151R/H and 176L/F) are located in the homeodomain (table 3). No synonymous substitutions were observed in the entire coding region of RHOXF2, an indication of on-going positive selection on current human populations. In the chimpanzee lineage (node A to chimpanzee ancestor), there are 5 non-synonymous substitutions while a 7-aa deletion without any synonymous substitution was located in the homeodomain (figure 2). The Ka/Ks ratio is significantly larger than one (P < 0.01, one-tailed Z test) , again supporting the hypothesis of strong positive selection on the RHOXF2 homeodomain during the evolution of humans and chimpanzees. Note: The ancestral alleles in humans were determined by comparing with the non-human primate species. The frequencies shown are the derived alleles. In Old World monkeys, RHOXF2 were duplicated twice independently, one in the leaf monkey lineage and the other in the macaque lineage (in the common ancestor of rhesus macaques and pig-tailed macaques). Theoretically, it is also possible that there have been three copy loss events (the ancestor of DL and YGM, the RG lineage, and the ancestor of STM, AM and PDM) which can explain the observed pattern although it is less parsimonious than the proposed two independent duplications. Strong positive selection was detected in the Yunnan snub-nosed monkey lineage as well as in the lineage including rhesus and pig-tailed macaques (figure 2). Taken together, during the evolution of primates, along with parallel gene duplications and/or losses, positive selection has been acting on multiple primate lineages leading to the rapid protein sequence changes of RHOXF2. To exam the expression pattern of RHOXF2 in primates, we performed real-time qPCR in four primate species (rhesus macaques, the white-browed gibbon, chimpanzee and humans). The general expression patterns in human, chimpanzee and gibbon are similar, consistent with the reported data in human and mice [15, 39], in which RHOXF2 is preferentially expressed in the testis (figure 5). However, the rhesus macaque showed a very different expression pattern. RHOXF2 is expressed in all the major tissues, but the highest expression was observed in the lung instead of the testicle (figure 5). This was further confirmed by testing two more individuals (one 2 yr male and one 2 yr female) (see additional file 9). The functional implication of the preferential expression of RHOXF2 in the lung of rhesus macaque is yet to be dissected. The expression patterns of RHOXF2 determined by qPCR in humans(a), chimpanzee(b), white-browed gibbon(c) and rhesus macaque(d). The relative expression levels were calculated by setting the expression level in testicle as "1". For the human samples, Brain 1(40 yrs), Brain 2 (28 yrs), Brain 3 (newborn, 1 month) and testicle (76 yrs) are all male individuals. The human embryo is a 36-weeks female. The ages of the nonhuman primate samples are 2 yrs for the male chimpanzee, 6 yrs for the male white-browed gibbon and 20 yrs for the male rhesus macaque. "NC" refers to negative control. The detailed sample information of the nonhuman primate species is described in Materials and Methods. It is noteworthy that we also observed expression of RHOXF2 in the brain. In humans, RHOXF2 is weakly expressed in the brain compared with the testis, and there are between-individual and between-developmental-stage variations (figure 5). In Wayne et al. (2002), the brain expression of RHOXF2 was not detected, which was likely due to the insensitive technology (Northern blot) used. RHOXF2 is also expressed in the brains of chimpanzee, gibbon and rhesus macaque. To examine the expression of individual RHOXF2 paralog, we cloned and sequenced cDNAs of the two RHOXF2 copies in humans, and screened 7 adult human testicle samples and 4 human brain samples. We found that both copies are almost equally expressed in all testicle samples (clone counting, 20:17; see additional file 3), implying that the two copies are functionally redundant in the human testis. However, in the human brain, the expression pattern is different. In the embryo and new born brains, both copies are expressed (clone counting, 34:20; see additional file 3), while only one copy is expressed in adult brains (clone counting, 35:0; see additional file 3), suggesting tissue and developmental stage related expression divergence of the two RHOXF2 copies during human evolution. In the chimpanzee brain, we detected four cDNA sequences (clone counting, 34:45:4:1) and two of them are the major forms. One of the major forms (clone counting, 45) is a novel splice form that was not detected in the chimpanzee testis, however, this form produces a truncated protein. The other two minor forms likely represent background expression due to their truncated open-reading frames (see additional file 2, additional file 3) and low expression levels. Interestingly, all four brain-expressed forms are from only one of the six gene copies in chimpanzee, suggesting between-copy expression divergence, similar to the pattern observed in the human brain. In the rhesus macaque, the expression pattern is similar among testicle, brain and lung, in which Copy-1 is preferentially expressed (clone counting, 59:7 for testicle, 41:3 for brain and 19:0 for lung; see additional file 3). We have presented a novel case of rapid evolution of an X-linked homeobox gene in primates. Interestingly, unlike the few previously studied cases [8–10, 13, 14], RHOXF2 also shows copy number variation among primate species. We showed that there had been parallel RHOXF2 duplications and/or losses along multiple primate lineages, which were likely mediated by the flanking ERVs. A similar gene duplication pattern was also observed for the mouse Rhox alpha subcluster paralogs [8–12], and gene loss was reported in the Hox gene cluster in nematode [5, 6]. RHOXF1 and RHOXF2 are the only members of the Rhox family in primates . Due to the rapid evolution of the Rhox family, RHOXF1 and RHOXF2 are highly divergent from their rodent orthologs. However, their functional roles in the reproductive system have been maintained in both rodents and primates. In the mouse, Rhox5 is expressed in both male and female germ cells in developing fetal gonad [41, 42]. In adults, it is expressed in the testis, epididymis and ovary [43, 44]. The Rhox5 null mice are subfertile, with defects in spermatozoa production and motility [8, 41]. The mouse Rhox cluster has more than 30 genes with partially overlapping expression patterns, and plays partially redundant but distinct functional roles [8–10, 18, 45]. RHOXF1 and RHOXF2 in primates are functionally similar to Rhox5 in mouse. In the testis, both of them may down-regulate Unc5c and Pltp expression, but only RHOXF2 can up-regulate Gdap1 expression . During primate evolution, RHOXF1 was apparently highly conserved and likely maintains its original functional role in the reproductive system. In contrast, RHOXF2 has evolved rapidly leading to potential functional divergence in primates. Darwinian positive selection is likely the key driving force leading to copy number variation, rapid amino acid changes as well as potential functional (e.g. gene expression pattern) divergence of RHOXF2 in primates. In several species, e.g. rhesus macaque and leaf monkeys, selection and lack of recombination have caused distinct sequence divergence between the two RHOXF2 copies within each species, which could lead to functional divergence. In humans, signals of rapid evolution and positive selection were also detected. However, due to frequent non-allelic recombinations, the two human copies have not clearly diverged. The situation in chimpanzees is much more complicated in which both rapid evolution and gene pseudolization might have occurred. It has been shown that gene copy number and expression level are highly correlated . For homeobox genes, due to their important roles in development, dosage changes may lead to functional consequences [47, 48]. As the major function of RHOXF2 in primates is male reproduction, we speculate that the observed strong selection in multiple primate lineages is likely to be related to sperm competition in promiscuous mating systems [49, 50]. Among the 17 primate species studied, four species showed strong signatures of positive selection (human, chimpanzee, Yunnan snub-nosed monkey and rhesus macaque), and all of them have promiscuous mating systems [51–57]. This pattern is also seen for the Rhox cluster in rodents . In addition to its potential role in spermatogenesis, RHOXF2 may also be involved in the functioning of the nervous system. All the three down-stream genes directly regulated by RHOXF2, i.e. Unc5c [19, 20], Pltp [21, 22] and Gdap1 [23, 24] also play important roles in the central nervous system. Hence, the brain expression of RHOXF2 in primates implies its possible involvement in brain function. In humans, only one of the two RHOXF2 copies is expressed in adult brains, and both copies are expressed equally in the brains of embryos and new-borns. This suggests a potential role of RHOXF2 in brain development [16–18]. Thus, it is likely that RHOXF2 may function in both the male reproductive system and the central nervous system through interactions with the down-stream genes. The question remains as to just how the expression of RHOXF2 is regulated in these different tissues. It has been shown that the genome-wide gene expression patterns are similar between brain and testis in humans . Interestingly, the human RHOXF2 protein down-regulates the expression of the Netrin-1 receptor, Unc5c [16–18], expressed in both brain and testis [16, 59]. In the brain, the UNC5C protein level is mainly influenced by the Netrin-1 protein, which increases apoptosis of the UNC5C-expressing neurons [60, 61]. In the testis, Unc5c prevents Sertoli cell from apoptosis and ensure sperm production . A genome-wide analysis of cancer-testis (CT) gene expression showed that RHOXF2 is a CT gene with testis-selective expression . Coincidentally, the CT genes are also expressed in a high percentage of human central nervous system tumors . The potential functional role of RHOXF2 in the brain is likely the outcome of Darwinian positive selection which has driven the rapid evolution and functional divergence of RHOXF2 in primates, especially those species with more than one gene copies. It is well known that brain evolution is not always positively associated with reproductive fitness . A mutation with advantages for brain function may sometimes be detrimental to the reproductive system (and vice versa). Therefore, natural selection will result in a balance between the competing demands and advantages of brain and testis functions. As RHOXF2 may play a dual role acting in the testis and brain, it may have developed certain mechanism for balancing potential functional conflicts between reproduction and cognition. One potential molecular mechanism is the between-copy gene expression divergence, e.g. in human, both of the RHOXF2 copies are equally expressed in the testis, but only one copy is expressed in the adult brain. The potential functional divergence of different copies are yet to be elucidated by further studies in the future. In summary, we provided an informative example of rapid evolution and copy number variation of an X-linked homeobox gene (RHOXF2) in primates. Our sequence analysis indicates that parallel gene duplications/losses were likely to have been mediated by the flanking ERVs, and the rapid evolution of RHOXF2 had been driven by Darwinian positive selection on the male reproductive system and possibly also on the central nervous system, resulting in between-copy sequence and expression divergence among the primate species with more than one gene copy. All of the DNA samples used in this study were taken from collections by the Kunming Cell Bank of CAS, Kunming Blood Center and Shanghai National Genome Center in China. The research protocol was approved by the internal review board of Kunming Institute of Zoology, Chinese Academy of Sciences. For DNA samples, a total of 111 human individuals from the major continental populations were sampled and sequenced, including 32 Africans, 21 Europeans, 10 Melanesians and 48 East Asians (Chinese and Cambodian). We also sampled 16 nonhuman primate species (10 Old World monkey species, 3 lesser ape species and 3 great ape species) reflecting a 25 million-year history of primate evolution (table 1). The sequences of a New World monkey species, white-tufted-ear marmoset (Callithrix jacchus) were obtained from the database (http://genome.wustl.edu). The coding region of the RHOXF2 gene (exon 1-4) was amplified by PCR and sequenced in humans and 16 nonhuman primate species. Universal primers for all species were designed based on published sequences of human and other primate species. The primer sequences are listed in additional file 10. We first sequenced the PCR products directly. Then the PCR products were cloned into a pMD19-T vector using the T-vector kit (Takara, Japan) and then transformed into E. coli DH5α. The individual clones were picked for sequencing. Sequencing was performed in both directions with the forward and reverse primers on an ABI-3130 automated sequencer. The pooled PCR-based method was used to screen a chimpanzee BAC library (CHORI251). According to the published sequences, the PCR primers were designed for BAC library screening. The best primer pairs were selected from the designed PCR primers through a series of pre-experiments. Primer sequences are shown in additional file 10. The BAC end sequencing was performed for all the positive clones . We collected various organs (heart, liver, spleen, lung, kidney, muscle, intestine, pancreas, testicle and brain etc.) of three Chinese rhesus macaques (Macaca mulatta) (one male and one female 2 years old, and one male 20 years old), one white-browed gibbon (Hylobates hoolock) (male, 6 years old) and one chimpanzees (Pan troglodytes) (male, 2 years old). We also collected human brain samples from one new born male (1 month) and two adult males (28 years, 40 years), and multiple tissue samples from a female embryo (36 weeks). cDNAs from 2 rhesus macaque testis, 7 human testis, 2 chimpanzee testis were used for full length cDNA sequencing. The total RNA samples were extracted with TRIzol (Invitrogen, Carlsbad, CA) following a standard protocol. They were treated with DNaseI (Takara, Tokyo, Japan) to remove possible genomic DNA contamination, then subject to reverse transcription using Omniscript Reverse Transcriptase (Qiagen, Valencia, CA) with oligo-dT primers (18 nucleotides), following the manufacturer's protocol. PCR was carried out at 95°C for 5 min, and then at 95°C for 30s, 59°C for 30s, and 72°C for 30s (or 2 min) for 35 cycles, and finally 72°C for 10 min. The primer sequences are presented in additional file 10. Cloning and sequencing were performed as described for the genomic DNA PCR products. The quantitative real-time PCR (qPCR) was performed using the SYBR premix ExTaq II (Takara, Tokyo, Japan) on a LightCycler 480 (Roche, Basel, Switzerland). For gene copy number estimation, the relative quantification method based on ΔΔCt was used to determine the relative copy numbers of the RHOXF2 gene in different species by comparison with a known single copy X-linked gene, transketolase-like 1 (TKTL1). The amplification efficiencies of RHOXF2 and TKTL1 in human and other non-human primates were tested and proven to be equal. PCR was carried out at 95°C for 4 min, and then at 95°C for 20s, 61°C for 20s for 40 cycles. For humans, chimpanzees, gorillas, orangutans and gibbons, the primers sequences are: NM032498_RT_F AGGGCATCAATGGCAAGAAAC and NM032498_RT_R AGGCTGCTGGAATGGCTGT; NM012253_RT_F TGGCAATCTTTGATGTGAACCG and NM012253_RT_R GGGGCAGGACAGAATGGAAAT. For the Old World monkeys, the primer pairs are: PEPP2-RT-owm-F AGAAGAGCCAAGTGGAGGAGACA and PEPP2-RT-owm-R GCAGTTACCATGACAGGCTGG; TKTL1-RT-owm-F CTACCGGGTGTTCTGCCTCAT and TKTL1-RT-owm-R AGATTGTCCAGACTGTAGTAGGAAGCA. For measuring the gene expression levels, cDNA real-time PCRs were performed and the expression levels were determined by using glycerol-3-phosphate dehydrogenase (GAPDH) as the internal reference gene. PCR was carried out at 95°C for 2 min, and then at 95°C for 10s, and 64°C for 20s for 40 cycles. A variety of tissue types (heart, liver, spleen, lung, kidney, muscle, intestine, pancreas, testicle and brain etc.) were tested in Chinese rhesus macaques (one male and one female of 2 years old, and one male of 20 years old), white-browed gibbon (one 6 yrs male), chimpanzee (one 2 yrs male) and human (three brain samples, one testicle sample and multiple tissue samples from one female embryo). The GAPDH primers are identical in all four primate species: GAPDH_F ATTGCCCTCAACGACCACTTT and GAPDH_R GGTCTCTCTCTTCCTCTTGTGCTCT. The RHOXF2 primer pairs are: for humans, pepp2-HUM-QF1 CGTCCACGCCTTCACCCC and pepp2-HUM-QR1 GTCTCCTCCATTTGGCTCTTCTATT; for chimpanzees, PEPP2-cRT-chp-hum-F1 CGAGCAGTTCCCCAGTGAGTT and PEPP2-cRT-chp-R1 CCATTGATGCCCTCTGATGTCTC; for the white-browed gibbon, pepp2-GB-QF3 ACTACAGGATATGAATGCTGCGGT and pepp2-GB-QR3 TGCTGCTTCTGTGCCTTGCT; For rhesus macaques, pepp2-RM-QF2 CAGGAGCTGGAGCGCATTTTC and pepp2-RM-QR2 CCTCCACTTGGCTCTTCTATTCTCA. The PCR product lengths are 164bp, 128bp, 100bp and 132bp respectively. The primer pairs are from different exons of RHOXF2 to avoid potential genomic DNA contamination. The list of the primers used is given in additional file 10. For each tissue sample, one RNA extraction was prepared, and the qPCR was repeated three times. The positive BAC clone DNA was extracted according to the modified alkaline-lysis method. CHORI251-281C1 BAC clone DNA was labeled by Nick-translation with Biotin-dCTP (Invitrogen). The FISH method was described previously . To eliminate the effect of cross-hybridization of common repeat sequences, the probes were blocked by using repetitive DNA (Cot) before hybridization. At least 10 independent metaphases or interphase nuclei were examined in determination of chromosomal band location. Sequence data was edited and aligned using DNASTAR (DNASTAR, Inc.), then inspected and confirmed manually. The DNA haplotypes (or copies) of humans were inferred using PHASE . The haplotypes of other nonhuman primates were determined by cloning and sequencing when more than two heterozygous sites were observed. 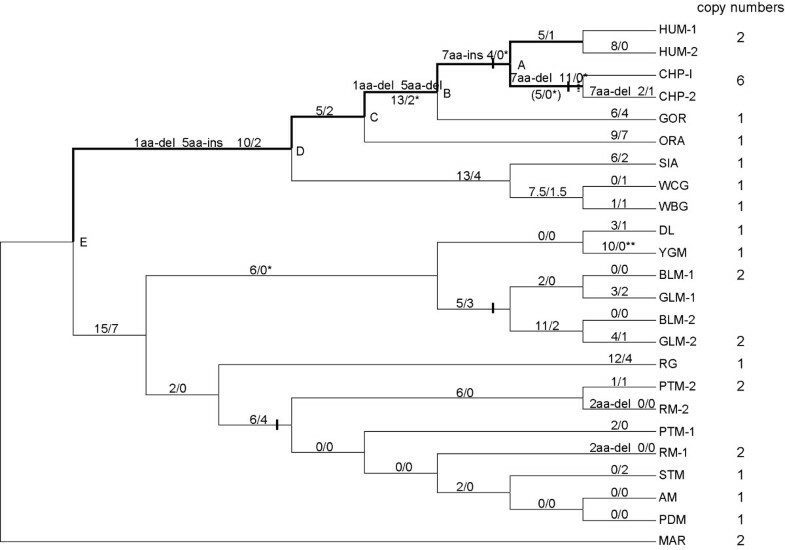 For phylogenetic analysis, a neighbor joining (NJ) tree was constructed using MEGA4 . Synonymous and non-synonymous substitution rates (Ks and Ka) were calculated using Pamilo-Bianchi-Li's method [65, 66], and the one-tailed Z test was used to detect deviation from neutrality [37, 38]. Using PAML , the ancestral sequences of the internal nodes of the phylogenetic tree were inferred, and the substitution patterns were compared among different evolutionary lineages. Based on Yang's method , the selection model 2a (comparing with the neutral model 1a) was used to test positive selection in primates. Modified model A (thick lines in figure 2, i.e. the branches from the most recent common ancestor of Catarrhines to the human and chimpanzee lineages were taken as the foreground and compared with the corresponding null model with ω2 = 1 fixed) was used to test if there have been positive selections (Ka/Ks > 1) during the origins of humans and chimpanzees. Ao-lei Niu, Yin-qiu Wang, Hui Zhang contributed equally to this work. This work was supported by the National 973 program of China [grant numbers 2011CBA00401, 2007CB947701]; the National Natural Science Foundation of China [grant number 30871343]; and the Natural Science Foundation of Yunnan Province of China [grant number Y003721111].We are thankful to the technical help of Xiao-na Fan, Hui Zhang and Yi-chuan Yu. We thank Dr. Phillip Kaitovich for providing the testis cDNA sample of chimpanzee. We also thank Dr. Darren Curnoe for this critical reading of the manuscript. BS, YQW and ALN conceived and designed the experiments. ALN, YQW, JC, CHL, JKW, RZ and HZ performed the experiments. YQW and ALN analyzed the data. BS, YQW and ALN wrote the paper. All authors read and approved the final manuscript.